What if your nonprofit could bring in twice as many donations while only working to bring in one? Sounds crazy, right? Matching gift programs, however, make it possible for your nonprofit to do just that. If you’re not familiar with matching gifts, they are donations that companies will make to nonprofits after an employee has made a contribution and submitted the appropriate paperwork. The donor just has to submit a request to their company. Usually, the company matches gifts at a 1:1 ratio, but some corporations match at even higher ratios! Ways to promote matching gift programs. Click on the section you’re most interested in or read through the entire article for a full understanding of matching gifts! Incorporate matching gifts into your donation forms. Conduct a prospect research screening. Keep a record of donors who’ve made matching gift requests. Incorporate matching gift information in your fundraising campaign. Keep reading to learn more about matching gift best practices. Best Practice #1: Educate your organization. Making sure everyone has a baseline knowledge of matching gifts is the best first step to maximizing your contributions. It helps to make sure everyone is on the right page. Additionally, if your organization has the resources to do so, appoint a matching gift coordinator. This individual can be in charge of the team that promotes matching gifts to donors. Although matching gift programs aren’t a tricky concept, it’s still important that everyone on your staff understands the process. That way, they can relay the information to your donors. Having a matching gifts coordinator gives your staff someone to turn to if they have questions. The coordinator can keep track of all your matching gift records. If you’re looking to teach your staff about matching gifts, check out these free downloadable matching gift resources and presentations. 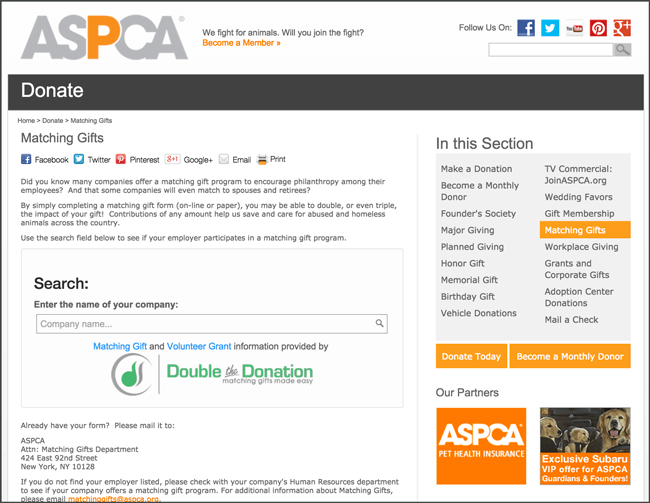 Best Practice #2: Incorporate matching gifts into your donation forms. As you acquire new donors and incorporate them into your donation flow, make sure that you’re letting them know about matching gifts. One of the easiest ways to do so is by optimizing your online donation form. You can integrate your online donation software with a matching gift tool, which will place information about matching gifts on your form. One of the most common reasons why donors don’t submit matching gift requests is because they don’t know that their employers offer such programs. Even if they are aware of their company’s matching gift program, they might not know about requirements, deadlines, or restrictions. By integrating your matching gift software with your donation forms, you help raise awareness around matching gifts. Additionally, you provide donors with an easy way to start the matching gift submission process. Looking for more information on integrating your software? 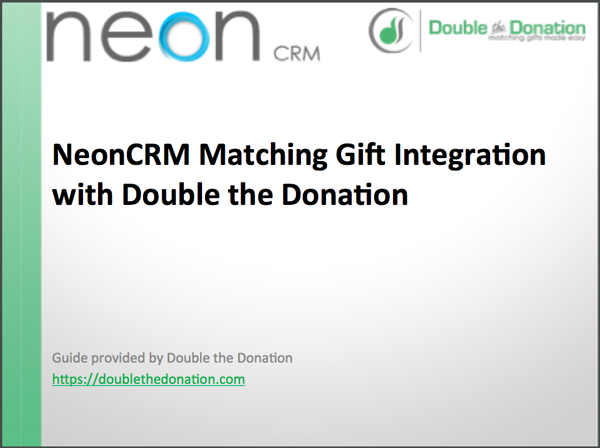 NeonCRM and Double the Donation’s integration simplifies the process of keeping up with new donors and marketing matching gifts to them. Best practice #3: Conduct a prospect research screening. Prospect research can reveal a wealth of information about donors. A screening can reveal simple information like names and addresses as well as more complex data like past giving patterns and business affiliations. Additionally, prospect research can identify where donors currently work or where they retired from. You can use this information to your advantage when it comes to matching gifts! The information you gain from prospect research can help you know what matching gift programs to promote to supporters. For example, if you gain knowledge about your donors’ employer, you can send them matching gift reminders with specific instructions about submitting a request for their company. Plus, knowing where your supporters retired from can help you identify even more matching gifts since some companies will match retirees’ donations to eligible nonprofits. To figure out more information on your donors, you’ll need prospect research software. You can get more information on this research process with DonorSearch’s ultimate guide. Best Practice #4: Keep a record of donors who’ve made matching gift requests. If you want to ensure your organization’s success when it comes to receiving matching gifts, you’ll need to keep good records and track your nonprofit’s progress. By integrating your matching gift tool with your CRM, you can make managing all of this data so much easier. When donors submit information about matching gifts on your online donation form, all of this data will automatically be filtered into your database. When you track matching gift metrics and keep records of which donors submit a request, you can better determine how to market matching gift programs to your donors. You’ll know what donors have made gifts in the past and be able to send them timely reminders whenever they make another donation. With the comprehensive data tracking and robust reporting and analytics capabilities included in your CRM, you should be able to get much deeper insights into how many donors are submitting matching gift requests. Additionally, keeping track of matching gift metrics can be used to show board members and other key individuals in your organization the impact that matching gifts have on revenue. If your nonprofit wants more information about managing your donor data, check out this donor database guide. Best Practice #5: Incorporate matching gift information in your fundraising campaigns. When donors contribute to a fundraising campaign for your nonprofit, you already know that they’re invested in your cause. Why not let them know about matching gifts while you have their attention? Your next fundraising gala or auction. Your organization’s walkathon or fundraising run. When you send out communications about your fundraising events, include some information on matching gifts and link to your matching gifts page or another resource where donors can learn more. By informing contributors about matching gifts during peak giving times and at fundraisers, you can not only double the donations you receive, but you can further promote your cause to donors and the companies they work for. Matching gifts shouldn’t just be a concern for corporations and donors. Nonprofits can benefit by promoting them to donors and keeping records of the donations they receive, as well as appointing a matching gift coordinator and performing prospect research screenings. For more information, check out this ultimate guide by Double the Donation. Encouraging donors to look into matching gifts can seem difficult at first, but it’s not so hard if you use the right strategies. Luckily, we can help you market matching gift programs to your supporters. Whether you want to inform first-time donors about matching gifts or provide existing and dedicated contributors with enlightening resources, we can help you encourage donors to make their donations go further. Whether you want to inform first-time donors about matching gifts or provide existing and dedicated contributors with enlightening resources, we can help you encourage donors to make their donations go further. Encourage matching gifts as donors are making initial contributions. Create dedicated matching gift pages. Include matching gift information in your acknowledgments. Promote matching gifts on social media. #1: Encourage matching gifts as donors are making contributions. One of the easiest ways to let your donors know about doubling their contributions is to promote matching gift programs during the donation process. You can let your supporters know about matching gifts by incorporating an optional field on your donation page. Look at Texas A&M University’s Association of Former Students as an example. They provide an eye-catching link leading to useful information about employers’ matching gift programs, including instructions for submitting the paperwork. By incorporating an optional step about matching gifts in your donation form, you can help them learn more and potentially put in a request. Giving donors the opportunity to learn more about their company’s matching gift program on your donation page is a useful way to encourage donors, because they’re already in the giving mood and will likely take extra time to look into matching their contribution. Use NeonCRM and Double the Donation’s resources to encourage your donors to submit matching gift request. And, learn how NeonCRM can help you set up and customize online donation forms! #2: Created dedicated matching gift pages. You don’t just want donors to know about matching gifts; you want them to remember them. One solution is to create a designated page on your website that contains information about matching gifts. Having a matching gift page gives your donors a place to refer to when they have questions about submitting a request or checking their employer’s program. The more knowledge donors have on the program, the more comfortable they’ll be with the process. Statistics about matching gifts and online donations in general. A short list of companies that offer matching gift programs. An explanation or example of how matching gifts are impactful. Tips on how to submit matching gift requests. A matching gifts tool so that donors can search for their company’s program. Plus, if you create a matching gifts page, you can link back to it when sending out newsletters, Facebook or Twitter posts, or even thank-you emails. Learn more about dedicated matching gift pages here. #3: Include matching gift information in your acknowledgments. Sending out thank-you letters immediately after your supporters give keeps their gift fresh in their minds. It makes sense that thank-you letters are the perfect opportunity to remind donors about their company’s matching gift program. After showing your appreciation for the gift, include some information on matching gifts. 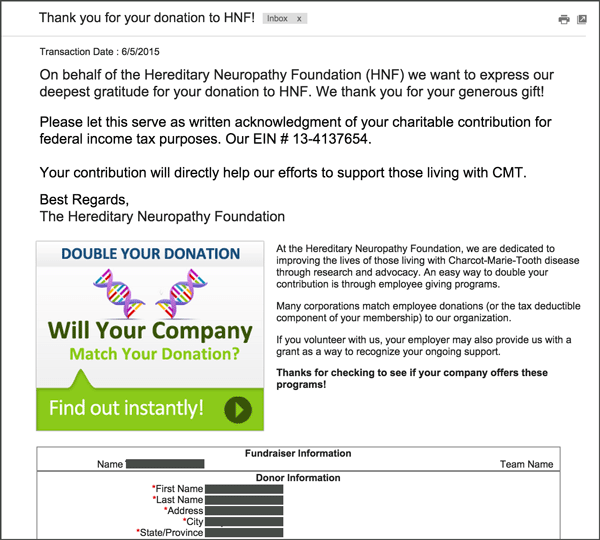 The Hereditary Neuropathy Foundation (HNF) offers a perfect example of how a genuine thank-you email can be paired with information about matching gifts. Notice that the first paragraph shows gratitude for the donors gift for his gift and then transitions into “Double your donation.” The HNF also includes a useful graphic and link directing donors to information about matching gift programs. The HNF also includes a useful graphic and link directing donors to information about matching gift programs. Check out these examples for acknowledgment emails. #4: Promote matching gifts on social media. By keeping followers up to date about matching gifts via popular social media sites, you not only pass along vital information to donors, but you do it in a format that most of them are already familiar with. Additionally, using social media can be a great way to connect with millennials. It can also be a good method to reach individuals who don’t know much about your organization. If donors share information about matching gifts, their followers will see the post. You can potentially acquire new donors and receive more matching gifts through social media. Facebook is the current social media giant, and you can use the site to promote matching gifts to donors. 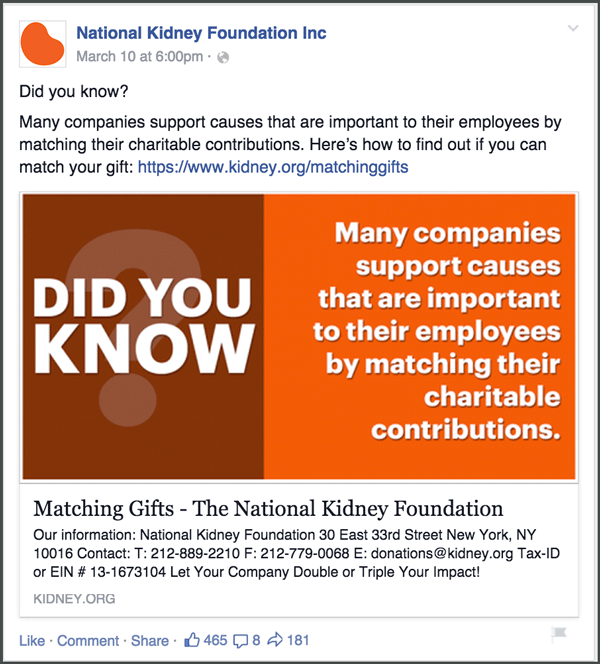 For instance, The National Kidney Foundation does a great job creating eye-catching posts and including links that direct followers to more matching gift information. This post alone garnered over 460 likes and was shared nearly 200 times! Twitter: Keep tweets short and to the point. You only have 140 characters, after all! Make sure you provide followers with a link to more info. Instagram: Use this image-based site to tell stories about the difference that your nonprofit is making. Include a link in your Instagram bio and encourage donors to maximize their donations with matching gifts. Pinterest: Create a dedicated “Matching Gifts” board and repin relevant articles and infographics for your followers to like and repin. The key to using social media sites to their greatest potential is consistency; engaging followers on a regular basis will help ensure that your posts promoting matching gifts do not go unnoticed. It’s crucial to keep your profiles updated regularly and thoughtfully. It’s better to have one or two solid social media accounts that promote your organization (and gift matching!) than a dozen profiles that remain silent and stagnant for months on end. If your nonprofit wants more tips on using social media to promote gift matching, you can find more information here. For more general social media tips for nonprofits, read John Haydon’s article about sprucing up your Facebook page. #5: Don’t forget email newsletters. If your donors don’t know a lot about matching gifts, a great way to help them get in the know is to send out gift matching information via your newsletter. By doing so, you can continue to foster the relationship you have with existing donors while also helping them make their donations go further. 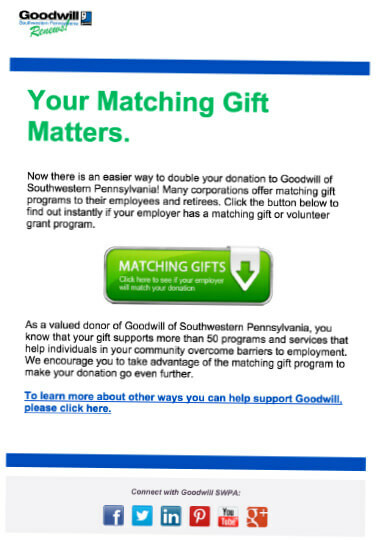 Goodwill of Southwestern Pennsylvania does an excellent job of letting donors know about matching gift programs. Additionally, the newsletter gives donors information about the different areas that their contributions support and provides them with links to more details about matching gift programs. Incorporating pictures, videos, or other information about projects that matching gift donations will go towards. Including a direct link to a useful resource geared toward matching gift information. Encouraging donors to search for their company’s matching gift program. It’s best not to bombard donors with too much information about matching gifts; the message could get too repetitive and therefore ignored. However, sending out newsletters that feature information about matching gifts could be scheduled during peak donation times, helping educate new donors and reminding dedicated and consistent donors that they can double or even triple their donation. Check out Nonprofit Marketing Guide’s list of nearly fifty tips for promoting matching gifts via email. To make the matching gift process even easier for your donors, use a matching gift database. Donors can simply search if their company has a program. That way, they can submit a request right after they give. Double the Donation helps you keep matching gifts in the forefront of your donors’ minds. Basically, the software lets you add company search tools to your donation forms and web pages so that donors can search for their companies. When donors can easily check if their company offers a matching gift program, they’re more likely to put in a request. What features does your nonprofit get? 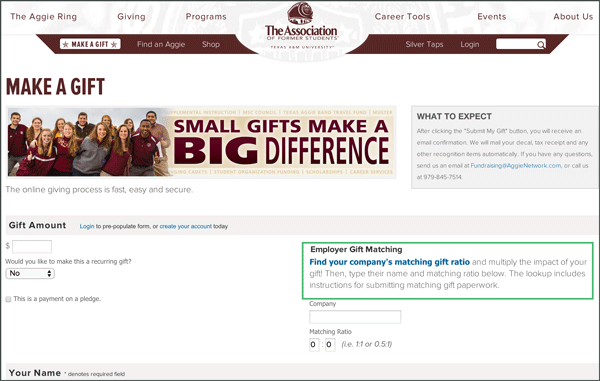 Matching gift search tool: You can add an embedded matching gift tool to any web page and donors can easily search for their employer. Matching gift pages: Create a page that includes information on matching gifts and how to submit a request. Plus, this page can become a great resource that you direct donors to. Integration with your donation forms: Have a company search tool on your donation form so that donors can search for the matching gift program that applies to them while they make a donation. Get more information about the features they offer here. Double the Donation is a good service to start with for small to medium nonprofits. They provide all the tools you need to make matching gifts easier for your supporters. With 360MatchPro, your nonprofit will be able to remind donors about matching gifts even after they contribute. Using automated software, your nonprofit can determine a donors’ employer and send your supporter emails with specific information about their matching gift program. Email domain screening: If a donor uses his or her company email in the donation form, 360MatchPro will send out an automated email with information on their company’s program. Search on donation forms: If donors search for their company in the donation form, they will be sent an automated email reminding them to submit a request. Track your donors’ progress: The automated emails will include links to where donors can submit a request. Each link can be tracked to determine if the donor clicked on the link and started the matching gift process. For more information on 360MatchPro features, check out this helpful resource. Reminding donors about matching gifts can be a lot of work, especially if you’re part of a large nonprofit. 360MatchPro can help larger organizations manage and promote matching gifts to their donors so that you can spend time on more important things. Whether you want to remind donors of matching gifts or you want to inform them over a period of time, there is a myriad of ways to get the word out and teach your donors about the process. By implementing a combination of these best practices, tips, and matching gift services, you can encourage your supporters to potentially double their donations. To learn more about matching gifts and other fundraising ideas, check out this helpful resource.